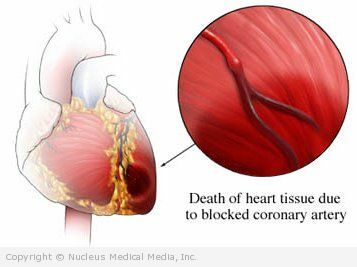 A heart attack occurs when blood flow to the heart muscle is interrupted. Oxygen cannot get to the heart muscle, causing tissue damage or tissue death. Within the first six hours after a heart attack, you may be given medicines to break up blood clots in the coronary arteries. Other medicines that may be given include those that block the function of platelets. During recovery, you may need physical or rehabilitative therapy to help you regain your strength. You may feel depressed after having a heart attack. Therapy and medicine can help relieve depression. If you have a heart attack, follow your doctor’s instructions. Begin a safe exercise program. Follow your doctor’s advice. Properly treat long-term conditions, like high blood pressure, diabetes, and high cholesterol. Although most people are able to tolerate such a low dose of aspirin, even this small amount can rarely lead to serious bleeding, particularly from the gastrointestinal (GI) tract . Aspirin may not work as well when combined with other pain medicines.